Looking to hire a skip bin in Brisbane? Whether you’re cleaning out all the junk in your house ready for moving day or if you need to dispose of a large number of items from your business premises quickly, at Cheapa Skips, we have skip bins in a wide range of sizes for you to hire. 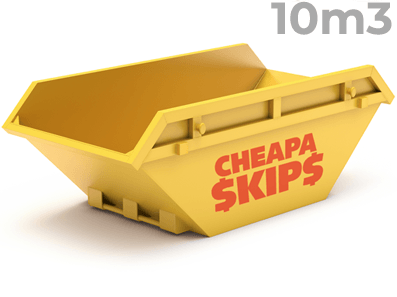 Our Cheapa Skips truck will turn up at your premises, drop off your skip bin in a convenient spot and pick it up again once it’s filled to the rim and ready to be taken away. But before you place your order with us, you first need to decide which skip bin size is right for you. For an accurate size comparison, a standard size wheelie bin is placed beside each skip bin in the photos below. Our 3 cubic metre bins are very popular for your standard clean-up around the house. This skip bin will easily fit all of those less bulky items. Also great for the small shed clean-up. Our 4 cubic metre bins are our most popular size for household or garden clean-ups. This size is suitable if you have some furniture or whitegoods to dispose of. Also great for the small shed clean-up. Our 5 cubic metre bins are suitable the larger amounts of household or garden clean-ups. You would look at this size if you have larger pieces of furniture or whitegoods to dispose of. Also great for the shed clean-up. Our 6 cubic metre bins are ideal for significant household or garden clean-ups. You would You may want to consider this size when disposing of larger pieces of furniture or whitegoods. Also, a great option for cleaning up your shed. Type of Waste – The type of waste you’re disposing of will be a big factor when deciding what size skip bin to hire. Furniture and white goods will take up more space than general and green waste. Boxes, foliage, branches and general garbage can squash down flat, meaning you can probably fit more in that you originally thought. Quantity of Waste – If possible, try to visualise how much waste you’ll be disposing of. If you’re unsure, always try and go one size up to make sure you can fit everything into the bin in one go. This is far more cost-effective than needing to hire a 2nd skip bin if you find out the one you hired isn’t big enough. Size of Your Premises – While you may have a lot of stuff to get rid of and would ideally like to hire a larger sized skip bin, you do need to make sure you have enough space to place the skip bin you want to order. Measure out the space you have available and ensure it’s in a spot the truck can easily access before placing your skip bin size order. Cost – You can consider downsizing your skip bin to save money if there are some elements of waste you can dispose of yourself or fit into your standard wheelie bins. By filling your wheelie bins to the brim first and deciding which items you could give to charity or place on curbside collection instead, you may be surprised by how much you can save on your skip bin size with what’s left over. 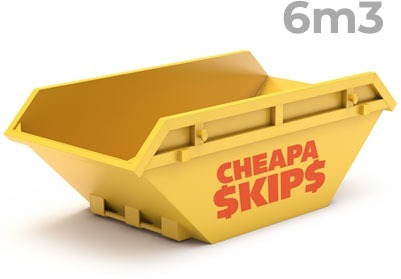 Want Help Choosing the Ideal Cheapa Skip Bins Size?